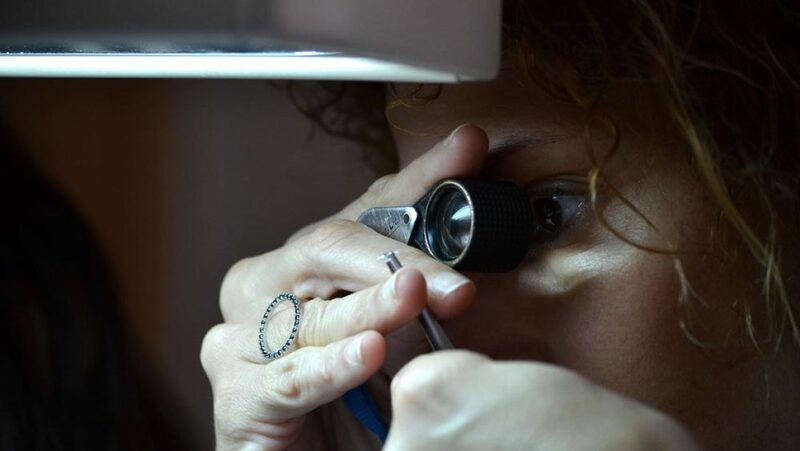 The clarity grade of the diamond is determined by its clarity characteristics and by their size, position, amount, kind and color as well as by their appearance in the loupe. It is difficult to repair them – repairing them substantially reduces the diamond’s weight. They are usually bright and thick, and therefore they look worse in the loupe. Pinpoint – If this is the only inclusion in the stone, It will have a high clarity grade. Cloud – A crowded group of pinpoints usually looks white mat. Sometimes a stone has a huge cloud inside it, and this causes the stone to look lifeless and pale – milky appearance. Twining wisp – a sequence of pinpoints, clouds and white, brown and black crystals. Chip – usually appears in the girdle area or in the culet. Bruise – A dent on the surface of the stone that has tiny cleavages that penetrate the stone. KM – This treatment is suitable for large black inclusions which are very close to the surface of the stone. A laser beam is used to open a cleavage in the stone that touches the black inclusion. Acid that melts the graphite is injected through the cleavage. After the treatment the only evidence of treatment are a cleavage and a white inclusion. Since these features can naturally occur in a diamond, it is very difficult to determine that the stone was treated. 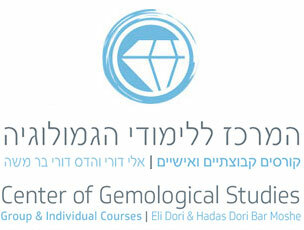 This treatment can usually only be identified by a gemological institute. It is easy to repair them – repairing them does NOT substantially reduce the diamond’s weight. They have no brilliance and no thickness, and therefore they are not immediately visible in the loupe. Natural – A natural imperfection in the stone, which looks white, rough, and not brilliant, usually in the shape of a triangle in the girdle area. Naturals are usually not removed in order to conserve weight. It can affect the clarity grade to: I.F. Also it affects the symmetry grade of the stone. Scratch – Looks like a thin white line. It affects the polish of the stone. Extra facet – An extra facet in the stone in the shape of a triangle, used to cover minor external imperfections such as a natural, a scratch, or a chip. An extra facet affects the clarity grade to I.F. It also affects the symmetry of the stone. Indented natural -Usually has steps or geometry shapes on it. Cavity – A hole in the stone. Etch Channel – An inclusion that looks like a pipe in the stone. Very rare. Knot -A crystal of a diamond that developed inside another diamond. The sawing and cutting directions of the knot are different from those of the larger diamond. Therefor the knot interrupts the sawing and cutting processes and it might affect the polish of the stone. FL (Flawless) – A stone which is completely clean and has no internal or external characteristics. IF (Internally Flawless) – A stone which has no internal inclusions, but can have minor external imperfections such as a tiny natural, or a tiny scratch. VVS1, VVS2 (Very Very Slightly included) – Stones which have very very small internal inclusions, such as pinpoints, clouds, needles and tiny cleavages. VS1, VS2 (Very Slightly included) – Stones which have small internal inclusions. SI1, SI2 (Slightly Included) – Stones which have medium-sized internal inclusions. I1 (P1), I2 (P2), I3 (P3) (Included) – Stones which have large or very large internal inclusions that are seen with the naked eye. How to decide what is the clarity grade by loupe and by microscope? If an inclusion is not seen under 10x magnification (by the Loupe) or by the microscope, it will be ignored and will not affect the clarity grade. F external imperfections can usually be seen only by microscope under 10 x magnifications. Even though a natural can be seen by the Loupe. VVS1 internal inclusions and most VVS2 internal inclusions can be seen only by the microscope under 10 x magnifications. The difference between VVS1 and VVS2 is that VVS1 internal inclusions can be seen only from the pavilion under 10x magnification and VVS2 internal inclusions can be seen from the pavilion as well as from the crown under 10 x magnifications in microscope and sometimes with the Loupe. VS1 internal inclusions are seen with much difficulty by the Loupe. VS2 internal inclusions are seen with little difficulty by the Loupe. SI1 internal inclusions are seen quite easily by the Loupe. SI2 internal inclusions are seen very easily by the Loupe. I1, I2, and I3 internal inclusions are seen with the naked eye (without the Loupe). SI3 inclusions are either inclusions whose size fit I1 but are seen only with the Loupe. Five criteria’s to determine the clarity grade. The size of the inclusion. The position of the inclusion. The amount of the inclusions. The kind of the inclusion – internal or external. The color and appearance of the inclusions. Is the inclusion black or white? Is the inclusion brilliant or matte? Internal inclusions are marked in red. External imperfections are marked in green. Extra facets are marked in black. Internal inclusions which are seen from the crown will be marked in the crown in red. External imperfections will be marked where they are in green. An open cleavage that touches the surface of the stone will be marked where it is in red. Combined inclusions such as a cavity, or indented natural will be marked where they are in both green and red. An inclusion should be marked only once.